Home > Target > Get 12 Procter & Gamble Products for $15 at Target! 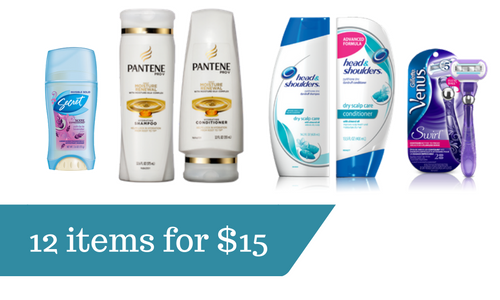 Get 12 Procter & Gamble Products for $15 at Target! There are two new Target Cartwheels out to get 25% off Pantene and Head & Shoulder’s items. Pair those in with a current gift card deal in stores and you’ve got great prices. I would recommend going one step further and taking advantage of a current mail in rebate with these offers. On the rebate your total must be $50 after all coupons used so keep that in mind. Note: The new cartwheels expire Sunday 12/18, so you need to head in this weekend for this deal. Makes it $15.18 for everything! That is like paying $1.26 each or a super price for each of these items. Plus now your bathroom is stocked for a while on things you need for everyone. All of these items are in the Target deals list this week if you want to add them to your shopping list.